Through mentoring, business angels offer more than just money. Mentor-driven capital is creating value for startups by sharing the knowledge, experience, and network gained over the course of a career, actively supporting founders to maximize the return on investment. Where capital is only one aspect, a mentor-driven capital approach uses mentorship to guide entrepreneurs to success. Understanding how to add value to a starting business is core to becoming a successful Business Angel. • How can you help entrepreneurs become strong leaders? • How can you support the founder team in achieving their business objectives? • How can you unlock your network and expertise for the growth of the company? • How can you use your experience to help the company navigate the market? • How can you do this in your own interest to maximize value and improve chances of a successful investment outcome? These seem like easy questions but there are tried and tested practices for how to do this. VC4A is working with leaders in the industry to provide you with the best tools and lessons learned available anywhere. Most importantly, we engage with experts from across the African startup industry to make the content and design of our programs contextually relevant. We share this introduction to Mentor Driven Capital and Community Guidelines as resources in your own journey to become a successful mentor and business angel. 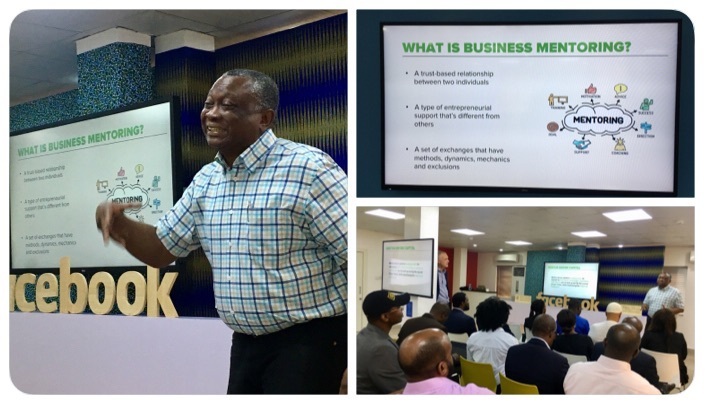 Through mentorship, you will engage your peers in a truly unique hands-on learning experience in which through shared vision and hard work, great African companies are born. VC4A believes Mentor Driven Capital is core to unlocking the continent’s potential. Not only is the pool of entrepreneurial talent coming up across Africa expanding, the number and the quality of ventures are improving over time. These companies represent a powerful collection of innovations, products, and services that have the potential to transform every industry. At the same time, as these businesses grow they offer new sources of income and produce high-quality job opportunities. As the turnover of these businesses grow they provide African governments with new sources of tax revenue needed to invest in infrastructure and social services. And for ventures that achieve great levels of success, there is a healthy financial return for the investors that took the risks early and supported the effort with their Hard (money) and Soft Capital (Time, Network, and Expertise) when they needed it most. Where any startup requires cash to operate, it is the application of capital in smart ways that secures a greater impact and return on investment. VC4A research shows a clear relationship between venture performance and the support these ventures received from the startup ecosystem. For example, companies on average raised more capital, USD $210,000 with ecosystem support vs USD $84,000 without ecosystem support, and are more likely to be generating new jobs. This is significant when considering 60% of the new jobs created are for individuals under the age of 36. Considering this impact, and given the continent’s growing population, Mentor Driven Capital has a critical role to play in supporting the continent’s entrepreneurs. It is also where a good Business Angel can make the difference between venture failure, survival and success. What makes Mentor Driven Capital unique? The focus and emphasis are too often on the money part of early-stage investing, when we know that the soft contribution Business Angels can make for startups adds the most value. Where any startup requires cash to operate, it is the application of capital in smart ways that secures a greater impact and return on investment. More importantly, Business Angels are in a unique position to add value. They often bring deep industry experience, an extensive network of contacts and many lessons learned from years of being in the industry. The Business Angel can provide a level of support an entrepreneur will not get from a traditional Bank, VC investor or most Startup programs. Business Angels can provide hands on support when companies need it most! What defines Mentor Driven Capital and the Business Angel? • Investing hard capital (money) without offering the entrepreneur soft capital (time, expertise, and network) means the individual is an investor. Investing soft capital (time, expertise, and network) without investing hard capital (money) means the individual is a mentor. Mentor Driven Capital is the combination of both and is what defines the Business Angel. The business angel investing money into the business means they most likely stand to benefit financially from any successful outcome. This ‘skin in the game’ helps to create alignment between entrepreneur and Business Angel, and where both parties are working towards the same objectives. At the same time, there are many reasons why startups fail at an early stage. The risks are only compounded when operating in nascent markets where infrastructure can be lacking. Investing capital into a business and expecting success is often short-sighted. This is where supporting the entrepreneur in the decision-making process and actively unlocking opportunities for the entrepreneur to tap into can only improve the chances for a positive outcome, and can often mean the difference between failure, survival, and success. Skin in the game helps to create alignment between entrepreneur and Business Angel, and where both parties are working towards the same objectives. It is not always possible for the investor to engage as a mentor. Sometimes the investor is too busy or should focus on other business priorities. This is not necessarily an issue if both parties are upfront about this at the start of the relationship and to manage expectations. This is to prevent a situation in which the entrepreneur is expecting support they are not going to get or the investor being inundated with requests they are unable to follow up on. Investing money into the business is also not a requirement. It is not always possible. It can be that the Mentor does not have the financial resources to invest in the business or that the entrepreneur is pursuing a fundraising strategy that doesn’t allow for the mentor to participate as an investor. Again, this is not necessarily an issue, but where both parties need to understand the incentives that motivate their partnership from the beginning. Sometimes a mentor is looking for new career opportunities, wants to better understand a market or industry, or simply wants to give back. Any of these reasons are valid for wanting to engage with startups in a formative stage, but where it’s important for both parties to understand what motivates their engagement and to set realistic expectations. That said, there are a set of principals we can all subscribe to as a community. Anything that streamlines the investing process, helps ensure fair dealings and offers a common and shared code of ethics is good for the community. We share these Principals as a reference point for Entrepreneurs and Business Angels structuring their interactions and working to align their expectations. It is not a contract, but a simple philosophy we own and manage as members of a shared network and community. Entrepreneurs deserve to know the intentions of the Business Angel and what they can realistically contribute in terms of Hard and Soft capital support, but where the Business Angel should have the right to the truth and the whole story. Looking at the African investment space, too often the real threat isn’t a ‘scam entrepreneur’ trying to pick up free money, but Business Angels stringing Entrepreneurs along as they endlessly research the opportunity or look for ways to take advantage of a market situation where they benefit from the Entrepreneur’s lack of information. The Entrepreneur has the right to protect themselves and to know about the Business Angel, their background and true intentions to invest. At the same time, Business Angels deserve transparency from the Entrepreneur. They have the right to know about ANY and ALL factors that could in anyway jeopardize the venture’s ability to operate successfully. Rogue employees, copied intellectual property, pending lawsuits or other issues should be disclosed or the engagement is doomed to fail from the start. Proactive sharing and a complete and honest story are essential for both parties to engage successfully. Put your money where your mouth is. If a Business Angel makes a commitment it is fair for the Entrepreneur to hold the Business Angel to their word. If a commitment is made by a Business Angel it should also be executed in a timely fashion. Otherwise false promises simply stall an Entrepreneur’s progress and hinder their efforts. So also to know when the Business Angel is still putting together a pitch deck to raise capital for their fund, needs co-investors to join in the deal, or simply can’t make a decision. Entrepreneurs should document an agreement as quickly as possible and get confirmation from the Business Angel in writing. At the same time, there are situations in which the Business Angel is unable to proceed for whatever reason. Given the terms of a deal change the circumstances, or new information is brought to light during the due diligence process, the Business Angel always has the right to pull out of a deal. The Entrepreneur has the right to keep a controlling stake in the company. After all, it is the Entrepreneur who creates the opportunity and should have the most invested in the future of the venture. There is no reason for the Business Angel to take a majority stake in the business. At the same time, the Business Angel has the right to a financial return and should always have the mechanisms necessary to protect their investment. This can be through a preferred status when distributing dividends or terms enacted when the business exits. The Business Angel also holds the management team accountable for their performance. The Entrepreneur deserves a straightforward deal under fair terms. There is no reason to reinvent the wheel. There are standard documents that can be used to establish deal terms that are good for all parties involved. Following best practices helps to streamline the investment process, minimizes legal costs and avoids any potential misunderstandings. No party benefits from confusion or surprises later down the road. At the same time, the Business Angel always has the right to protect their investment and to secure a reasonable return. But where control mechanisms are built into a deal, the Entrepreneur should at least understand how they work and under what conditions they can be actioned. Business Angels need to think for themselves. It is not ok to keep the entrepreneur guessing, leading them on with the prospect of investing, and constantly changing the conditions for their participation. Either the Business Angel is interested in investing and will make a commitment or they won’t and should step away from the deal. Be crystal clear about this. Don’t spend three months on due diligence and drag the process on endlessly. It’s the indecision that prevents the creation of great companies. Fast decision-making is what gets deals done and pushes new ideas into the world. At the same time, the Business Angel has the right to conduct due diligence and to make sure they have adequate levels of information needed to place an investment. Many times, it is not about the money but about the network, knowledge, and business experience a Business Angel can bring to the table. Entrepreneurs need partners in building their business and the Business Angel should play a proactive, constructive and supporting role in helping their companies achieve success. This means making themselves available to the Entrepreneur when needed. At the same time, the Business Angel has the right to be involved in strategic issues as they are known by management and the Entrepreneur should take the input, insights, and advice of the Business Angel into serious consideration when dealing with important issues. The Entrepreneur is in control of the company and is the key actor in building the business. If the Business Angel loses confidence in the Entrepreneur, the first step is to strengthen the team with the right expertise. At the same time, the Business Angel should be able to monitor a venture’s progress and hold the Entrepreneur accountable for the results. When things are simply not being taken care of, it is time for the Entrepreneur to go. There should be no surprises about when and how this happens! Building a company anywhere in the world is difficult. Building a company in nascent markets where infrastructure is sometimes lacking can be even harder. Entrepreneurs have a right to turn to their Business Angel when they need help. Things happen differently than planned, and its inevitable things will go wrong. The Business Angel needs to be there to support the Entrepreneur when they do. At the same time, monies invested in the company should be allocated as agreed. The Entrepreneur should not sit on unused funds, waste or redirect resources out of character with the terms of the investment. Business Angels have the right to hold the Entrepreneur accountable and to protect the capital they have put into the business. Entrepreneurs might find reporting time consuming and distracting from building the business. Sometimes it seems like a never-ending cycle. Especially when the Business Angel follows up with question after question. The Entrepreneur has the right to focus on the tasks of building a great company while the Business Angel has the right to get accurate, timely and transparent feedback. Reporting expectations should be agreed up front. It is impossible for the Business Angel to know about every aspect of the company, but where the entrepreneur must take the effort to ensure the Business Angel knows about any issues of material importance to the business. There is no crystal ball and anything can happen, expected or completely unexpected. Both the Entrepreneur and the Business Angel have the right to protect their investment. At the same time, as a member of the VC4Africa community, we should remain fair to each other in our dealings no matter what happens. Building the African startup ecosystem means we must trust in each other, building on our willingness to collaborate and compromise as needed. After all, at the end of the day we are all in this for great African venture success! VC4Africa is a community of entrepreneurs and investors who share an interest in building businesses in Africa. As part of this community, we believe the future of the continent depends on our ability to unlock the most promising ideas. We all have a responsibility to lead by example because at the end of the day, our mission is to realize human potential for the benefit of the world. VC4A seeks to link as many entrepreneurs to growth opportunities as possible. Each connection, measured as a transaction, represents an entrepreneur connecting to the knowledge, network, and capital they need to succeed. VC4A supports the making of these connections through the core activity of building, improving and maintaining the VC4A.com website, a critical piece of infrastructure for supporting entrepreneurs building African ventures and key partners that seek to link their opportunities to entrepreneurs. As a member of the VC4A.com online platform, entrepreneurs have free access to the VC4A Startup Academy, Mentorship Marketplace and the ability to raise capital from more than 2,000 Africa focused early stage investors. More than 1,000 program partners engage members with their entrepreneurship programs, competitions, and services. A global network of investors use VC4A tools to discover great companies, research investment opportunities and to follow up with founders directly.